"Spain as the rising star in the world of wine". Formato de archivo: PDF (45 páginas). The Spanish Observatory of Wine Markets (OEMV) has presented the good situation of Spanish wines and better future in the IX Symposium of the Institute of Masters of Wine that takes place in, Logroño, Spain. 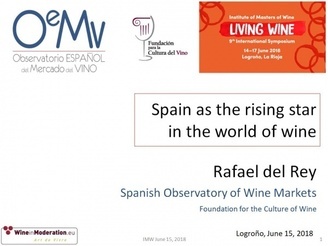 On the Friday morning session June 15, the OEMV has given a presentation on the current situation of Spain’s wines, their recent past and the reasons why they will be the “rising star in the firmament of wine” as was predicted by Robert Parker some years ago. In the framework of the international trends for wine, the presentation by General Manager of the OEMV as well as general manager of the Spanish Foundation for the Culture of Wine, Rafael del Rey, has pointed out the recent transformation enjoyed by Spanish wines, their great internationalisation, recovery of domestic market and progressive improvement in world trade of quality wines. ‘Spain’s fine wines are diverse, multiple and increasing’ said Mr del Rey ‘and they will be given more and more good surprises to the best wine international professionals’. ‘This big portfolio of great wines, together with the attractiveness of Spain’s gastronomy, landscape, artistic heritage and people, make Spain a really amazing experience’ he added. Date of publication: 15 June 2018. File format: PDF (45 pages).